IBC 2017 - 15 Days to Go! The presentations include trucks from Arena TV, EuroMedia, Express, Fuji Media Tech, Gearhouse Broadcast, GH ONE, HD Resources, Hessischer Rundfunk, Levira, Mobile TV Group, NEP Australia, NEP Norway, NEP Switzerland, NEP USA, NVP, Point2Point, RTM, SBS, Televizia Markiza, Timeline\TV, Turkmenistan and TV Globo. In addition, we cover stories on the future of the OB Truck, on some learnings of building 4K trucks, the first 4K truck in Sri Lanka and a SNG for ORF incorporating internet, video/radio production and IP streaming. 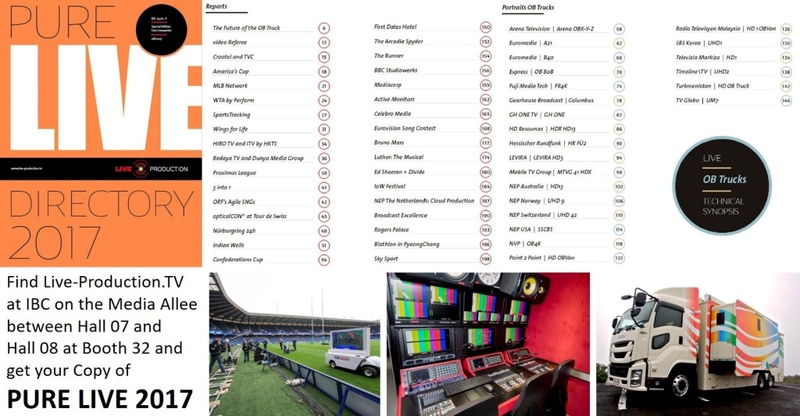 These technical Descriptions are embeded in 34 stories out of the world of highend sport and show productions like Confederations Cup, America's Cup, Bruno Mars or the Eurovision Song Contest from Kyiv, to only name a few. UHD 42 made its debut at the RSL season opener, a top match between BSC Young Boys Bern and FC Basel that took place at the end of July in the Stade de Suisse in Berne in front of a capacity crowd. Along with the UHD 41 OB – which was commissioned last year and is also being fielded for the Raiffeisen Super League – NEP Switzerland now operates two large-scale 4K/UHD OB Vans, and produces more than 140 league games in 4K during the season. Broadcast though the Teleclub Sport Pay-TV channel, RSL ranks among the world’s sharpest sports broadcasting. Dome Productions offers mobile 4K and HD production facilities, transmission services, studio facilities and full turnkey Host Broadcast services and a fleet of 18 multi-format production mobiles including three 4K trucks, seven support units, one production/uplink mobile and three uplink tractors to clients mainly for sports and entertainment events. “Dome has been a long-time customer of Wohler’s and has used its discreet AES and analog units, such as the VMDA-SUM8 and AMP1-E16V-MD, for monitoring in the past,” says Al Karloff, manager engineering services at Dome Productions. IBC TV is IBC’s annual dedicated news channel which delivers live news, interviews and more distributed on multiple platform including live on IBC website plus Facebook, Periscope, and Youtube and to screens throughout the RAI Exhibition Centre. It features event- and show- related news as well as key stories about exhibitors. Taking note from last year’s inclusion of the technology from the EBU-VRT Live IP Studio project, the now-IP-based channel will produce live programming using an IP infrastructure that’s set up over multiple areas. “We’ve again partnered with EVS because it’s the industry-leader in live production technology regardless of whether it’s SDI or IP-based and because its people understand our priorities in delivering the best live production throughout the show,” said Sue Robinson, producer at IBC TV. With the first patent application for an optical camera tracking system in 1997, Mo-Sys has gone on to create a low-cost, easy-to-operate and extremely reliable tracking technology in the following 20 years. The current version of StarTracker was introduced IBC 2015. The newest version of StarTracker, version 2.0., will be shown at IBC2017. It provides: enhanced smoothness, larger tilt capability, faster recovery, IP data output and a networked user interface. StarTracker’s found a home at major networks, including: BBC, FOX, Telemundo, NHK, Sky Sports, ZDF in Germany, Turner in USA and ESPN. “FINA was responsible for the entire AV installation for the event and they wanted a redundant, reliable, high-end system that could also be used for various events after the games,” explains Imre Makkay, Chromasound’s Sales Director, who was in charge of system design. “As well as DiGiCo, we are also suppliers of Meyer Sound loudspeaker systems, so it was obvious that we could provide them with the correct overall solution.” For the main venue, Imre chose the SD10 because he wanted to supply a console that did not compromise on capacity and had the added benefit of the ability to connect it to an SD-RE redundant engine. For the Premier League’s 26th season, which kicked off in August, BBC Sport introduced Reality Check Systems’ (RCS) LaunchPad touchscreen graphics and analysis solution into its live studio and remote production workflows for English Premier League and other sports broadcasts. RCS completed the integration as part of a new deal with the BBC, and will continue to provide ongoing system support to the network. LaunchPad primarily resides in BBC Sport’s Salford-based studio, where it has enhanced BBC Sport’s storytelling capabilities for Premier League and other sporting event broadcasts, enabling real-time analytics and telestrations before, during and post-match/game. The Pyramid stage is the most instantly recognized festival stage in the world. Rising from the site of a blind spring close to the Glastonbury Abbey/Stonehenge ley line, it is now in its third incarnation. Having transformed since 1971, the stage today is now four times the size of the original, however, still in the design of the original pyramid. The glittering 30m high steel structure covers 40x40m, uses four kilometers of steel tubing and weighs over 40 tons. For the first time ever, this year the pyramid top was lit creating the perfect frame for the majestic scene. Red Rocks Amphitheatre in Colorado is one of the most iconic concert venues in the world. Everyone loves playing at this unique setting with its special ambience … and for a recent Trey Anastasio Band (TAB) gig, LD Marc Janowitz used Robe BMFL Spots to highlight the magnificent rock formation at the back of the stage.Marc is currently on tour with the artist with whom he’s worked since 2012. It is the third TAB tour that he has designed, and this time, the design brief was to break everything right down to basics and take a pure-lighting approach with no video, scenic or backdrops. To accompany these broadcasts, Xiamen TV will also produce programming in UHD-4K – a feed which will be recorded for future use as well as for online broadcast. Implemented into Xiamen’ Media Group’s production center, the EVS servers will ingest up to 20 HD signals as wellbroadcast s as several UHD-4K feeds. IPDirector will allow operators to attach metadata to ingested content as well as make online edits to ingested assets and create and manage content playlists. Editors using the center’s NLE systems will be able to easily browse and search content using added metadata, which lets them take advantage of intuitive integration across the production infrastructure through a joined-up server system and post-production facilities.